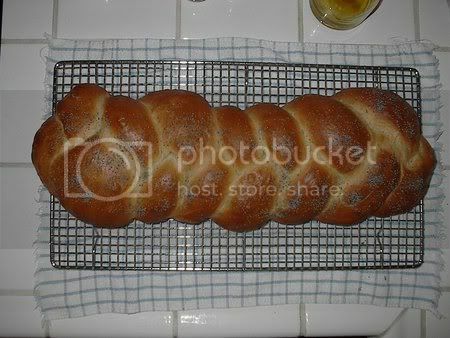 I followed Gordon's recipe for Challah bread. The only change I made came during the choice of flours. I didn't have any whole wheat around, so instead of 2 cups whole wheat and 2.5 cups flour, I used 3/4 cup of rye flour and the remainder unbleached flour. The taste is slightly nutty, but very tasty. I knew you could make it. Good job on the braid. And the color of the loaf looks beautiful. I bet it tastes really good. My mouth is watering now! :-D I bet it smelled awesome while it was baking too. It smelled WONDERFUL when it was baking. I can't believe that the bread came out so light and airy. You have that recipe down to a science,...thanks for sharing it! Great job .... Where can i fine the recipe? Here is the link for the recipe I posted a while back. It's partway down the page.